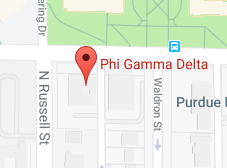 A phase well known to Fiji men is “Phi Gamma Delta is not for college days alone.” This saying resonates loudly at Lambda Iota. Our graduate brothers are very loyal to our chapter, and in turn, we are very committed to them. Our door is always open to our graduate brothers. We encourage our graduates to come back and enjoy our beloved brotherhood and chapter house. Nov. 14, 2018 – We are honoring Mitch Daniels, President of Purdue University, with the distinguished FIJI award at 640 N. Russell St. Remaining 2018 Home Football Schedule: You are welcome to park at the chapter house prior to tailgating for the game.